Using the latest research the Dementia Enabling Environments Project (DEEP) utilises a set of 10 evidence based principles which will provide architects, designers, landscapers, aged care providers and families with very practical information and advice on how to improve the environment. Each monthly e-newsletter will be covering an individual principle – explaining the philosophy behind it and practical ways to implement it. The DEEP project is about translating research on dementia design into practice. 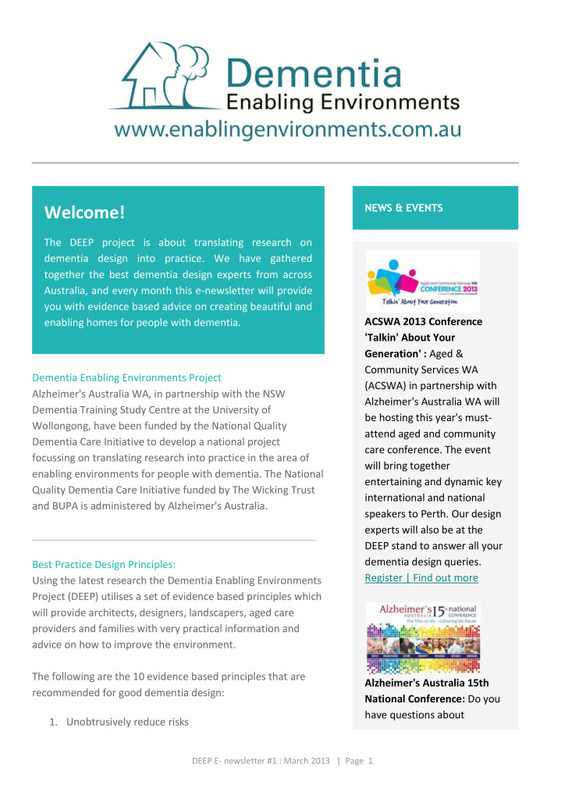 We have gathered together the best dementia design experts from across Australia, and every month our e-newsletter will provide you with evidence based advice on creating beautiful and enabling homes for people with dementia.